My dad was a cowboy. Really, he was a cowboy. But the range he rode, the cows he punched and his nighttime campfires out on the prairie, were all in his head. He was a 19th century cowboy trapped in a 20th century laborer’s body. His character, his personality and his outlook on life were all shaped by the ‘cowboy codes’ of the 1870′s, as they were described in the Zane Grey pulp fiction cowboy novels he constantly read. Cowboys were strong, self-reliant, quiet-spoken, and tough men. And this described my dad to a “tee”. When I was five years old, we lived in a small house in southeastern Tennessee. It was a rickety old place with intermittent heat, a leaky roof and a wood-fired cooking stove. Dad kept a supply of wood under the house and would bring an arm-load to the kitchen whenever my mother started to prepare dinner. One night dad went to fetch a load of wood, which generally required him to chop a few pieces of kindling with a hatchet. After he had been gone for a few minutes, he called for my mother to come outside. There she found my dad sitting on the ground with the hatchet buried 1/2 inch deep into his left shin. Mom had a scream like a banshee that terrified everyone within earshot and made even the slightest dilemma seem dire. But this time she got it right. Blood spurted from around the hatchet blade with a rhythm that coincided with Dad’s heartbeat. This was not good. My mom managed a moment of sanity and fetched a small towel from the kitchen. Dad calmly jerked the hatchet from his shin bone, wrapped the towel around the wound, secured it with duct tape and… drove himself to the hospital. And that, as they say, was “The Cowboy Way”. We were a poor family. It didn’t bother us much. We had always been poor. To be dissatisfied with poverty requires that you have some frame of reference, and since we had always been poor, we had none. Sometimes ignorance really can be bliss. The year after the ‘hatchet’ incident, we moved to a farm in Appalachia, but lost it soon after in the first of several bankruptcies. How much of a concern was bankruptcy to a family living below the poverty level? Hell, it was just another day. The bank took the farm, but Dad was able to salvage a few hundred dollars from the sale of our small cotton and corn crop, a single cow, four pigs, a dozen chickens and a duck. A nest egg to make a new start? Not when your dad is a cowboy. Dad decided we’d had enough bad news for a while and announced that we were going on a ‘Great Adventure’. “We’re going out west“, he proclaimed, but did not make it clear if we were going forever, or just a vacation. From the looks of the heel marks from my mom’s shoes as she was dragged to the car, it became clear that, at least she, was coming back. Mom was not the ‘old west” type. She was the serene, clean-sheet, warm-food, uneventful day type and wanted no part of Dad’s “Cowboy Way”. But, against any standard of common sense, off we went. I have many memories of that trip. You can imagine a kid that had never traveled more than a couple hundred miles from his birthplace finding himself on a road trip of some 6,000 miles. I had a blast – especially that time with the buffaloes. It was on a lonely stretch of two-lane blacktop, somewhere near the Montana / Wyoming border, we spotted a buffalo roaming alone on the prairie – then a couple more – then dozens. Real buffalo, just like in the books!! We were thrilled. A few miles further down the road, the seemingly random sighting was explained by a sign that said “Flying W Buffalo Ranch”. Dad turned into the long driveway. Mom was pissed. We pulled up to what appeared to be the main house and Dad told us to sit tight and he would be right back. A grizzled woman answered Dad’s knock at the door and he disappeared inside. A half an hour later, you could see steam beginning to blow out of my mom’s ears. She had seen this many times before. My dad was completely void of any sense of time – especially when he was with a bunch of guys that actually lived “The Cowboy Way”. “Son, go get your dad and bring him back to the car – RIGHT NOW!”, I was instructed. I went to the front door but no one answered my knock. I went around back of the house and heard several men shouting behind a group of small buildings and a corral, a hundred yards or so from the main house. As I came closer, I could hear one man’s voice above the surrounding pandemonium shout “Slap the iron to ‘em John!” as my dad burned the ranch’s logo into the flank of the beast with a white-hot branding iron. To make a long story short, we had just travelled 3,000 miles and sat in the car while my dad branded buffaloes. Mom was not happy. A round trip of some 6,000 miles with an unhappy wife, does not a fun trip make. Dad decided to make up for his transgressions at the buffalo ranch by taking us to a rodeo in West Yellowstone, just outside the national park. His heart was in the right place but Mom had about as much interest in rodeos as ‘Larry-the-Cable-Guy’ has in Italian opera. But, she understood human imperfection and knew what she was getting into when she married the man – ‘for better or worse’ she often reminded him. Plus, we were going to sleep in a motel that night, instead of sleeping in the car on the side of the road like we had for most of the trip. I had never been to a rodeo and was as excited as a ferret on a double cappuccino as we climbed into the grandstands. Bronc riding, calf roping, bulldogging, barrel racing – it was heaven, covered with a thick layer of dust. I was beginning to warm up to this ‘cowboy’ thing and began to form visions of wearing a giant brass belt-buckle that read “World Champion Cowboy”. Dad announced he was going for a beer and stood up to leave. “John, bring me and the boys a Coke when you come back. It’s awfully dusty and we need something to drink.” A half hour later, no beer, no Coke, no dad. “Son, go find your dad and tell him to get back here – RIGHT NOW! I complained because the bull riding had already started and I wanted to see the most highly regarded and toughest cowboys in the most dangerous event of the rodeo. But, you didn’t argue with a women with steam coming out of her ears, so I got up to leave. And there he was. Clinging for dear life on a deranged animal the size of a locomotive, bucking, kicking, and biting in an attempt to remove body parts from my dad. Of the eight seconds required for a successful ride, Dad barely made it through the first one. The second one was spent mostly in the air which preceeded a thud as he hit the ground. Then the bad news. The bull, in an attempt to show his disdain for the indignity my dad had put him through, charged with his head lowered. 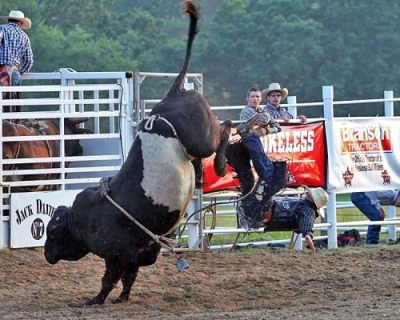 One of the rodeo clowns rolled a barrel in front of the bull, which he proceeded to launch into suborbital flight – but it gave another two guys time to drag my dad from the field of battle. To Mom, he looked dead. I found him sitting on a bale of hay behind the corral getting a couple of stitches in his leg from a medic. Another contestant – apparently a ‘lifelong friend’ my dad had just met – brought him a shirt to replace the one hanging in shreds from his bruised and bleeding shoulders. Until the day he died, I don’t think I ever paid him a higher compliment.